Are you looking for an excellent family-oriented dentist in Edmonton? Would you like to feel confident that you are receiving the best in care from an experienced and qualified team? 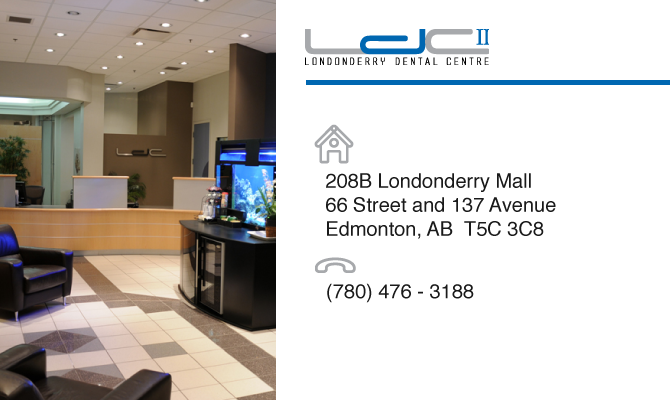 Londonderry Dental Centre II is the premier dental care centre in the area and offers treatment using the latest technology in a comfortable, friendly setting. “I’m going to the dentist!” That doesn’t usually bring up visions of comfort, relaxation, and enjoyment. But here at Londonderry Dental we are determined to make your experience in our office one you’ll remember with a smile. Everyone on our team is carefully chosen based on their expertise and their desire to help each patient feel comfortable and at ease. You can be assured that you are entrusting your dental care to the North East Edmonton dentist that will provide the highest quality services in a professional, efficient manner. We’ll show you all your treatment options, help you choose the one you feel is best, and complete the treatment plan in a timely, cost-effective manner. Whether you simply need a routine cleaning or you require oral surgery, extraction, cosmetic dentistry or crowns and bridges, we can help you. We’ll work with you to create a complete treatment plan that addresses any need you have, and we’ll suggest the best maintenance schedule to help keep your teeth in their best possible condition.